Welcome to the Olympic Experimental State Forest (OESF). Located on the western Olympic Peninsula in Washington state, the OESF encompasses approximately 270,000 acres (110,000 hectares) of state trust lands. It is designated with the objective of learning how to integrate revenue production (primarily through timber harvesting) and ecological values (primarily habitat conservation). The Washington State Department of Natural Resources manages state trust lands, including the OESF, to generate a sustainable flow of revenue to counties, universities and other state trust land beneficiaries. Yet, these lands also provide habitat for wide range of wildlife species, including federally protected northern spotted owl and marbled murrelet, both of which depend on late seral-stage forests. Streams in the OESF support robust populations of salmon at a time when many Northwest salmon runs are faltering. The OESF conservation objectives and conservation strategies are described in State Trust Lands Habitat Conservation Plan (HCP). In the OESF, DNR balances the two objectives by implementing an experimental approach called "integrated management." As the OESF Forest Land Plan describes this approach, the entire land base is managed for both revenue production and ecological values, rather than separating state trust lands into large areas managed for a single purpose. This is achieved through innovative silvicultural techniques, landscape-level planning, intentional learning through research and monitoring, and application of new information to management through a formal adaptive management process. See more about OESF environment, history and management. The OESF Research and Monitoring Program implements and coordinates research and monitoring projects on the OESF; establishes and maintains research partnerships with universities, colleges, federal agencies and other organizations; collaborates with local land managers, tribes, environmental organizations and regulators on research and monitoring projects; facilitates the adaptive management process at DNR; and provides educational opportunities such as internships and field trips. In 2009, the OESF joined the Experimental Forest and Range Network (EFRN), in an agreement between DNR and the U.S. Forest Service Pacific Northwest Research Station that encouraged collaboration between OESF and Forest Service scientists. See more about the EFRN and the OESF participation. Click image to open an interactive story map and explore the status of riparian and aquatic habitat in the OESF. 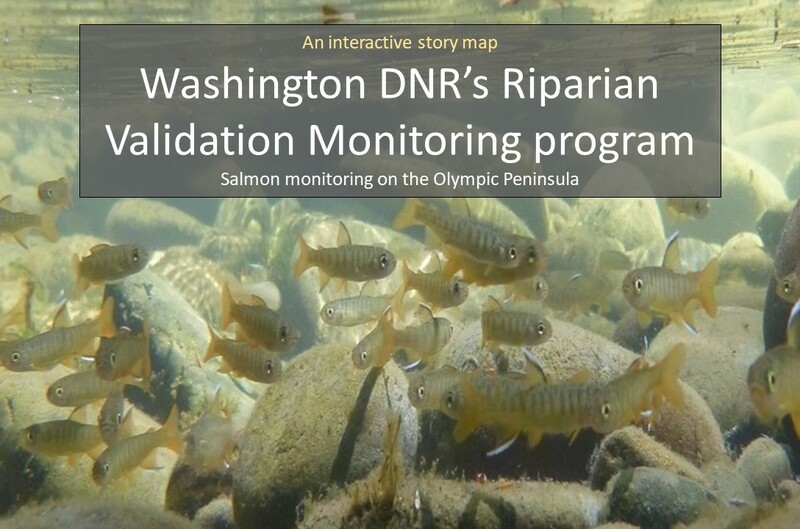 Click image to open an interactive story map and learn more about DNR's Riparian Validation Monitoring Program. Note that videos in the story map work best when viewed on a computer. Some videos are replaced with photos when viewed on a mobile device. Interested in doing research and monitoring in the OESF? DNR welcomes cooperation with research partners to conduct research and monitoring in the OESF and tries to support external researchers seeking to implement projects on state trust lands in the OESF. We encourage you to contact the OESF Research and Monitoring Manager about your ideas and proposals. We can work with you to find an appropriate site, secure permits and connect you with the appropriate DNR staff. The OESF Research and Monitoring Program is focused on DNR's needs for efficient revenue production, environmental protection, and long-term sustainability. The majority of the agency and collaborative projects are applied research and monitoring of innovative silviculture techniques, riparian and aquatic monitoring, and wildlife habitat development. See ongoing projects. 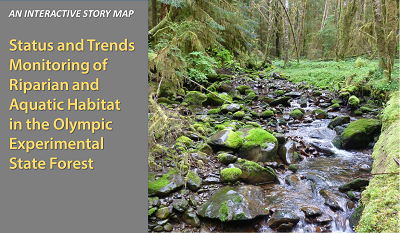 Silviculture and fish research has been conducted on state trust lands on the western Olympic Peninsula since the 1970s. After the designation of the OESF in 1992, it intensified and broadened to cover forest and wildlife ecology, geology, and riparian management among other topics. The majority of the past research and monitoring activities are listed in the OESF Research and Monitoring Catalog, published by DNR in 2008. See recently completed projects. Individual project data are available upon request to the project lead or to the OESF research and monitoring manager.